JERUSALEM — The Eurovision Song Contest announced Thursday that next year's competition will be held in Tel Aviv, clearing up some of the political controversy surrounding Israel's hosting of the 2019 competition. The Israeli government had initially insisted on holding the popular event in Jerusalem. But following a backlash over the U.S. recognition of Jerusalem as its capital and a subsequent fear of boycotts it dropped the demand to host the world's largest live music event. The Eurovision said it chose Tel Aviv, Israel's cultural and commercial epicenter, over Jerusalem and the southern city of Eilat because of its "creative and compelling bid." 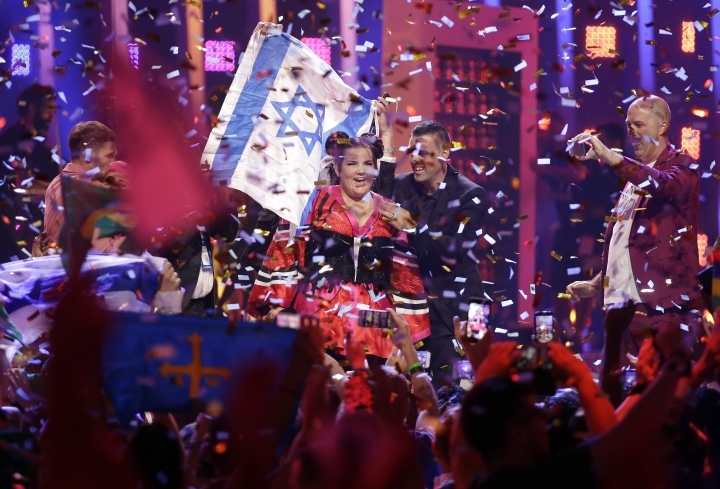 Israel won the Eurovision this year with a flashy pop tune called "Toy" by the charismatic, previously unknown singer Netta Barzilai, who dazzled viewers with her feminist lyrics, unconventional appearance and signature chicken dance. Her victory earned Israel the right to host next year's contest. But following the Argentine national football team's snub of an exhibition game in the city earlier this year Israel backed off its insistence. Fearful of being accused of politicizing the feel-good event, Israeli Prime Minister Benjamin Netanyahu resolved that the government would not intervene. By choosing Tel Aviv, the Eurovision appears to have made a safer bet. The coastal city is a top international tourist draw, far more associated with its vibrant night life than its politics. It boasts Israel's most rabid Eurovision fan base. Fans flooded Tel Aviv's Rabin Square in front of City Hall, with some euphorically jumping into a public fountain, after Barzilai was announced the winner this year in Portugal. The City Hall building was lit up to spell "Toy" and electronic signs throughout the city congratulated her. The Eurovision says its semifinals will be held in Tel Aviv on May 14 and 16 followed by the Grand Final on May 18. The Eurovision has previously provided Israel with some cultural touchstones.